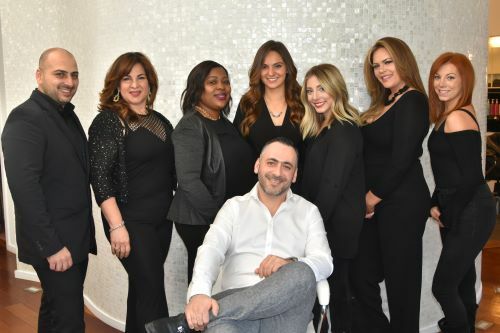 There has been a hair salon anchoring the northwest corner of Purchase Street/PurdyAvenue/Theodore Fremd Avenue for decades, but Numi, which blew into town seven years ago, is a cut above. “It’s a special place — we’re like family,” offered manager Tahesha Wilson. “It’s also a sophisticated place, especially for a suburban salon,” noted one local luminary earlier this week. He drives from Queens to the shop at least five days a week, but many of his clients come farther, from New Jersey, Westport, Manhattan, the other side of Westchester. Of Abramov’s 15-member crew, Asher Khafizov, his cousin, has worked with him the longest. “We went to beauty school together, then worked at a salon in the city.” Khafizov also came to America as a child and commutes to the salon from Queens. One of the benefits of being a Numi regular is that in-between trims — for clients with short hair, men included — are free. The stylists and colorists encourage new clients to come in for a consultation before making an appointment so that they can determine the right plan of action. It might involve application of the new organic Keratin treatment or result in a totally new style, but when you walk in the door you know you’re in good hands. We were going to give him the Mayor’s contact information, but then a City Councilwoman walked in for her appointment and they were deep in conversation when we left.